When one is trying to breed Corydoras, a special breeding tank will usually give better results than waiting for them to spawn in the community tank. Even if they do spawn in the community tank, it is very likely you will not notice it at all. The eggs are well hidden by the fish, and even if the eggs survive the hungry attentions of the co-inhabitants of the tank and the parents themselves, the larvae coming out of the egg are extremely vulnerable. The first thing they have to do when emerging from the egg is to go up for air to fill the swim bladder. Still, some may occasionally survive this, and after a month or three the owner will be in for a surprise when the first 2 cm long juvenile calmly cruises the tank for food. Let's assume you plan to breed a particular species of Corydoras. The general tank set up will be described below. The following information is not a must, but are things that have worked for me, or which I've read. By no means expect your fish to start breeding immediately, even after you've invested a lot of money to copy the described tanks, materials and fish. A Corydoras breeding tank should be long enough. As a rule of thumb, length of the tank should be at least ten times the maximum size of the adult fish. 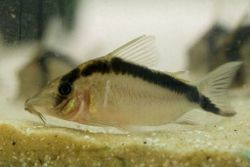 There have been numerous reports about full grown Corydoras paleatus spawning in a 30cm (11.8") tank or even smaller, but of course no-one reports the failures. Take it from me that the bigger the tank, the higher the success rate. Height of the tank should not exceed 30cm (11.8"). (The tank could be higher, but then simply do not fill it up over this height). This is one of the most important issues, although it's hardly ever mentioned in any set-up information. Of course the fish have to be healthy. And yes they should be fed well. But that is about all that is mentioned. First things first. A group of fish should be selected, and they should be mature enough. The best way is of course to buy full-grown wild-caught fish. If you buy wild-caught fish, the first thing to do is to make sure they are disease free. During transportation the fish are usually treated really badly. Large fish (the ones we want) are usually more expensive because of the higher death rate during shipping (lower water to bodyweight ratio) and because the shop owners know. Do not believe shop owners, they will try to get as much profit from sales as possible. Prices tend to sky-rocket for the people they know will buy this or that new or rare cory. Do not under any circumstance buy only three fish because they are expensive, and another three in a month's time. There is no guarantee they will be the same species, or type locality. Small fish will also grow big, although for most species it takes a minimum of two to three years to reach a reasonable size, and growth rate is reduced in tanks when compared to nature. If you'd like a nice looking tank, you are not going to like this part. Don't worry, the fish tend to breed in those as well. Hiding places: one will suffice - a coconut shell, or better yet create a cave with multiple exits by placing a flat stone on some smaller stones. Plants are optional, but not essential. Twelve to thirteen hours of light, preferably subdued light, or no light at all if the tank is near a window. Should be sand, approx. 0.5-1cm (0.2-0.4") layer. Strong filtration, especially in one area of the tank. But there should be areas where there is little or no current, so the fish can rest. Daily 50% water changes with pre-treated water, approximately 5-10°C (41-50°F) colder than the water in the tank. Be careful when changing the water - if a part of the glass is directly exposed to 10°C (50°F) colder water, it may break! Feed the fish well, as much as they like and more. (You're doing daily water changes, so any left overs are no problem). Feed them with red mosquito larvae (bloodworm), blackworms, daphnia, artemia, chopped earthworm and tubifex. If you keep this up for a week or two (or longer) most Corydoras will spawn . Some require more attention, and should be kept in soft, acidic water for a while. Then change the water with soft, neutral water, to get both a rise in pH and a drop in temperature. Be very careful when handling the eggs. The best thing to use is spawning mops, which will enable you to remove the eggs from the tank without handling them. Place the eggs in water taken from the spawning tank into a small holding tank. Still, many eggs may fungus, and most of the times the fish have a mind of their own as to where the eggs should be laid. If you have to remove the eggs by hand, wash your hands thoroughly before removing the eggs (making sure that no soap remains on your fingers). Some people use a razor blade to remove eggs from the glass, but I've never been able to do that right. Corydoras eggs are extremely hard, and you cannot squash them by handling them. Back to the eggs fungusing. Eggs fungus as a result of bacterial attacks, which results in the shells being damaged. The fungus is the second infection, because it attacks damaged eggs. Most of the times that I tried to raise the eggs in a separate raising tank, 60-80% of the eggs fungused. Adding a preventive medicine like methylene blue helped a bit to increase hatch rates. Later I started using breeding nets, which hung from the side of spawning tank. Hatch rates raised to around 90-95%. I keep the fry there, feeding them artemia, for a week or two, and then I transfer them to a raising tank. Using a pure glass bottom in a raising tank may seem to be a good thing to do, since it's easy to clean. But in my case the fry often developed fungus. In a glass-bottom tank a thin layer of bacteria will always be present, which may cause this. After I added a thin layer of sand, the fry stopped developing fungus. It's a really nice sight, having an 80cm (31.5") tank filled with over 100 juvenile Corydoras (in my case panda). You can observe some natural schooling behaviour, and watch them eat and grow. They can grow quite fast up to 2-3cm (0.8-1.2") (depending on the species), but after that growth comes to a halt, and it may take up to a year before the fry are the same size as the juveniles you mostly see in the shops. It will take at least a year more for them to become fully grown. Written by Eric Naus of Amsterdam, Holland in May 2005, Aquaworld. Article reproduced from AquaArticles and advised. This page was last edited on 15 May 2011, at 00:16.